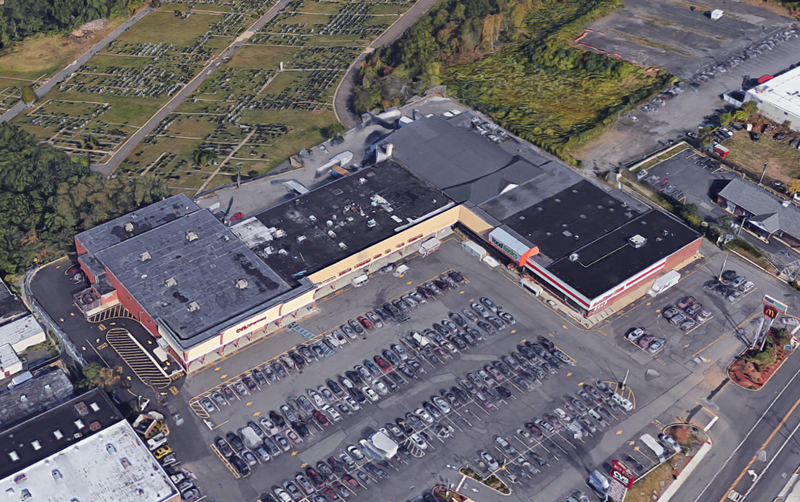 You can see that the part of the mall that runs perpendicular to the street was an expansion. The A&P would have co-anchored with WT Grant that later became CH Martin where CVS is now (at the far left end of the mall). 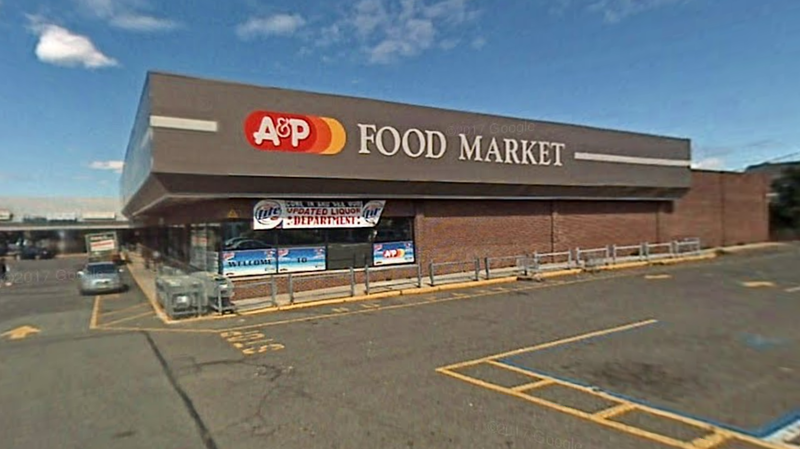 The store in the corner was an A&P until around 2009, when it was renovated into a Food Basics, actually decreasing the sales floor size. A 2009 Google Maps street view reveals the store's former appearance. 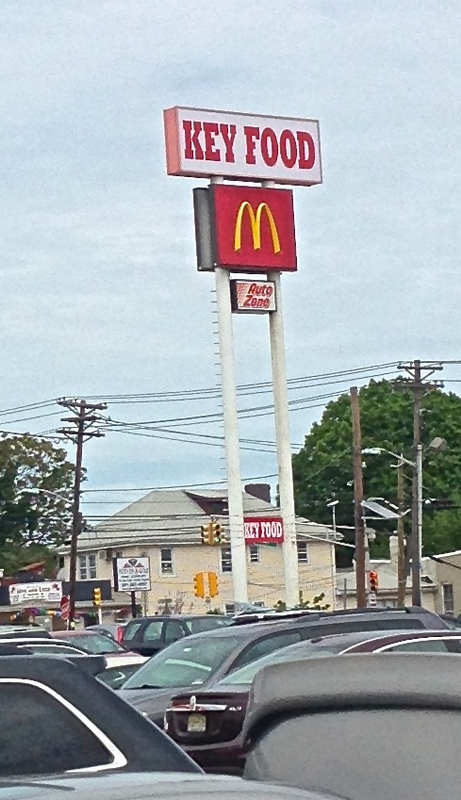 The space towards the end was an Auto Zone, which has closed. 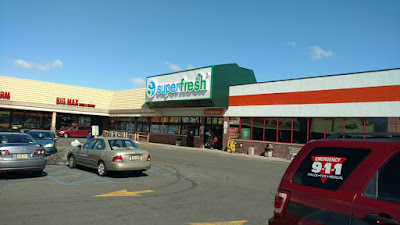 Key Food Marketplace today operates as a Superfresh, as part of Key Food's efforts to condense all of their suburban NJ operations into the Superfresh banner. The new owners have reopened service meat, seafood, deli, and hot food counters, and have added a juice bar and a sushi bar, which may not have lasted very long. 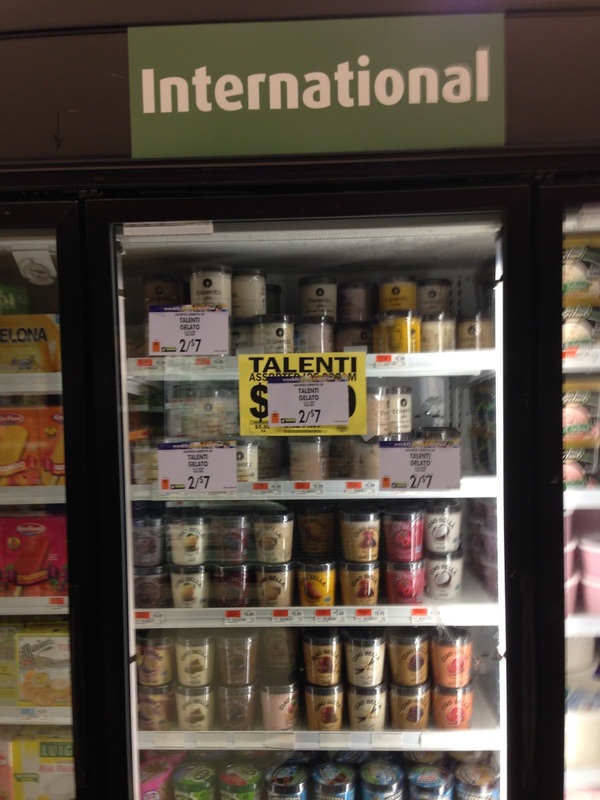 When I was here, though, the store was bustling and looking very good, although that was almost a year ago. The Key Food sign is, in fact, just a decal over the Food Basics awning that is still intact. A more recent photo from Facebook shows that the conversion to Superfresh has brought a real, lit sign. 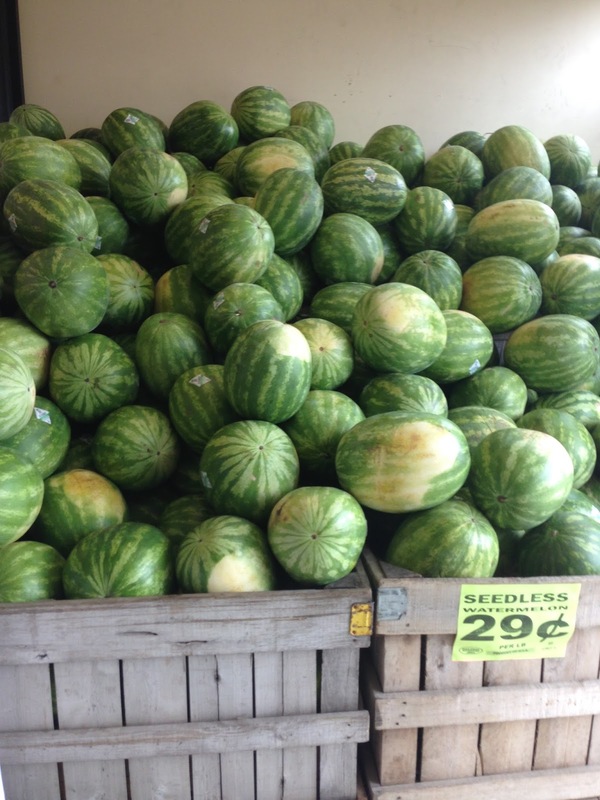 The entranceway had a large display of watermelons - I bet they won't run out anytime soon! One of the staples in Kevin Kim's stores (this one, Garwood, Edison, New Brunswick) is the huge FARM DIRECT WATERMELON banner which generally stayed up no matter what was in the display under it! Immediately inside the entrance is the Juice Bar and fresh-cut produce. (The juice is actually under the "Salad" sign just to the left!) 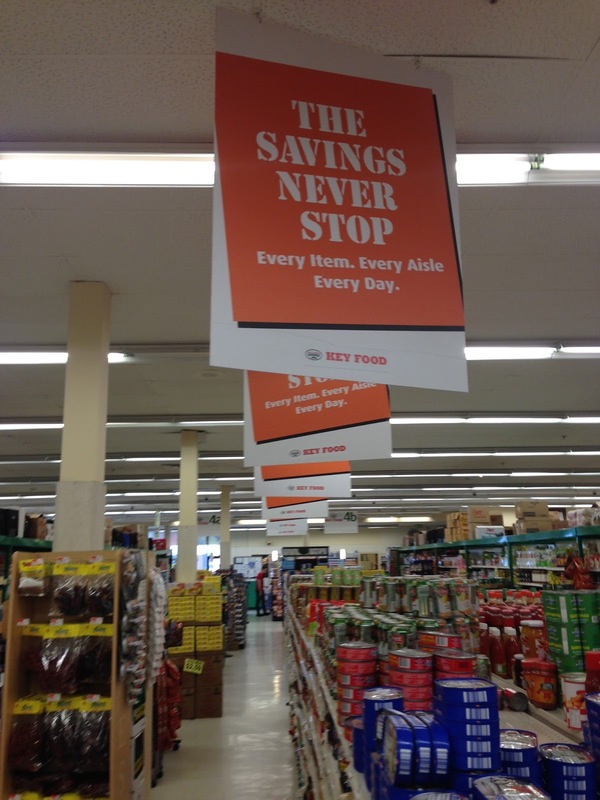 These graphics are all new, although the fixtures are likely left from Food Basics. The above 2009 photo from Food Basics on Flickr shows approximately the same area before Key Food's renovation. 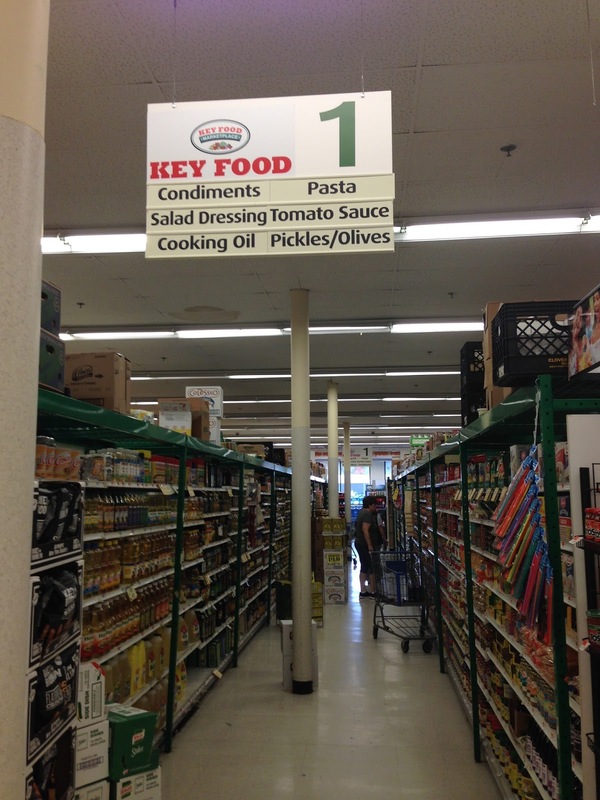 Key Food has added product shelving along the front wall of the store before the checkouts. 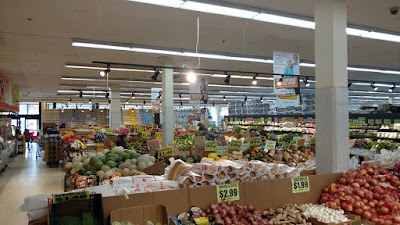 The produce department is quite extensive, and the new deli/prepared foods service departments run along the right-side wall. When I visited, the sushi department was still up and running. 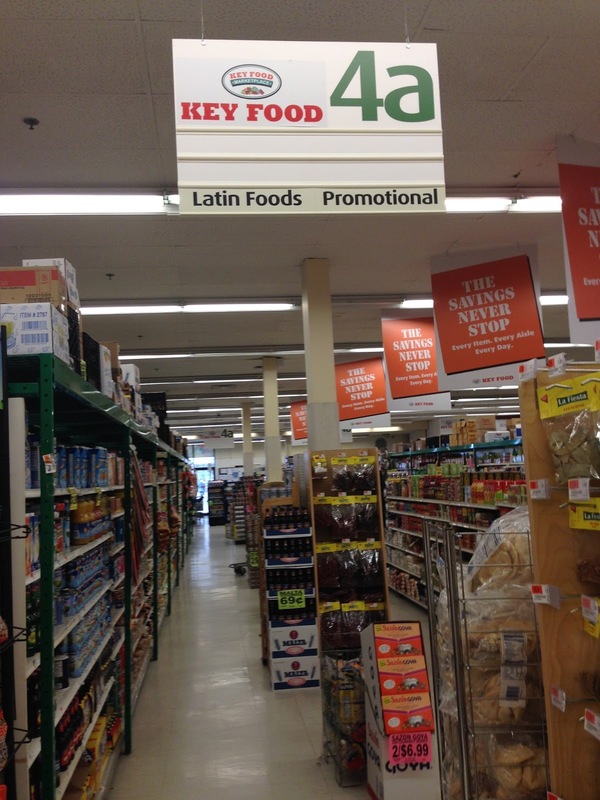 So was the hot food bar, which along with the deli department was installed by Key Food / Superfresh. The picture above is from my visit in May 2016. This picture, from March 2017, reveals that nothing much has changed on the inside. 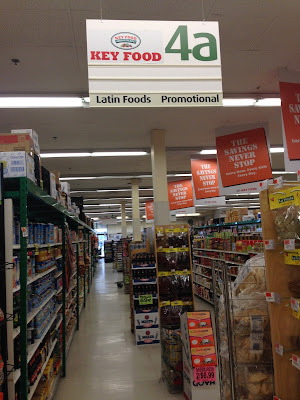 In fact, the store's promotional signs, which simply had Key Food decals over the Food Basics logo, still read Key Food. Close-up of the Key Food decal. The bulk nuts selection was also added by Key Food. Actually it's quite an impressive grand aisle. The large seafood counter is located in the back corner. 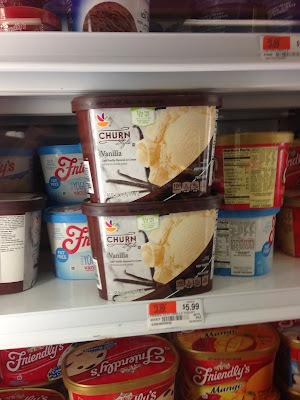 Additional packaged seafood is along the store's back wall, then dairy. 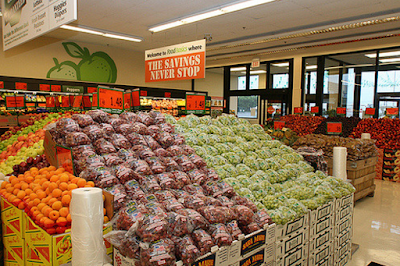 Food Basics would have had meats along the back wall, but Key Food has relocated the meat selection to an alcove in the far back corner of the store. I don't know what Food Basics would have had there, if anything. 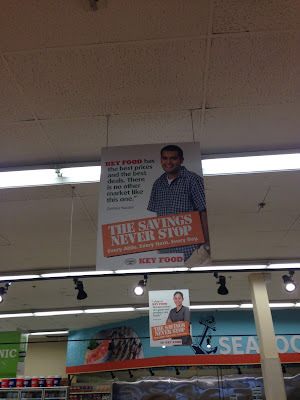 Key Food did, however, leave up the Food Basics sign even though it's damaged AND in the wrong place! Good job! The grocery aisles are largely the same as they would have been under Food Basics. 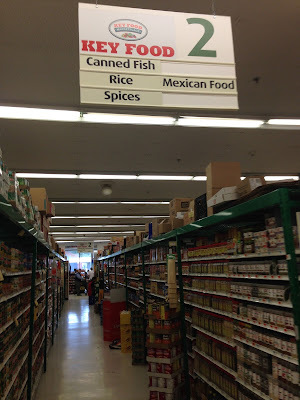 The aisle markers simply have decals over the Food Basics logo. Dairy runs along the back wall. The red wall straight ahead is where the new meat department is located. The fourth aisle is a double-wide aisle with ethnic foods and weekly specials. 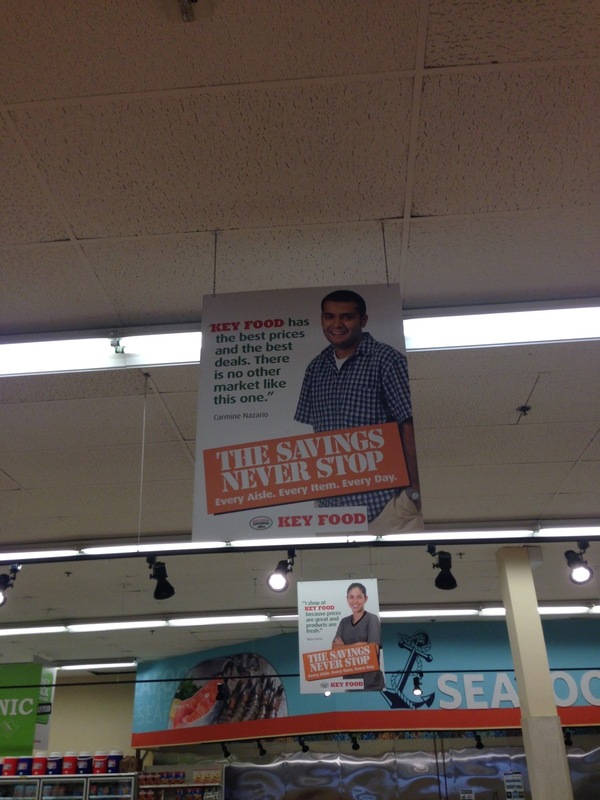 Food Basics signage is everywhere in this aisle! 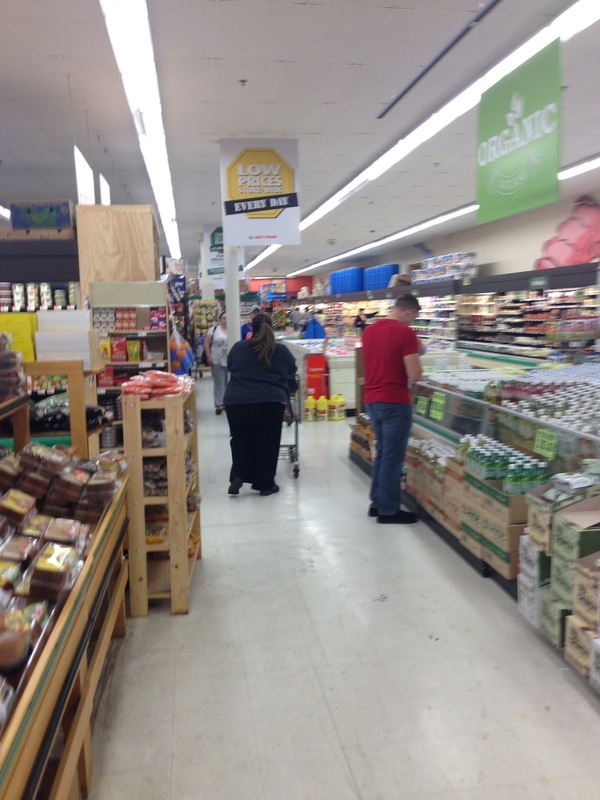 Along the last aisle, frozen and dairy cases line the side in the store, while meat cases line the opposite side. Under the lower-ceiling area, there are meat cases as well as a large service meat counter. It actually surprised me how small the meat area felt in this store. 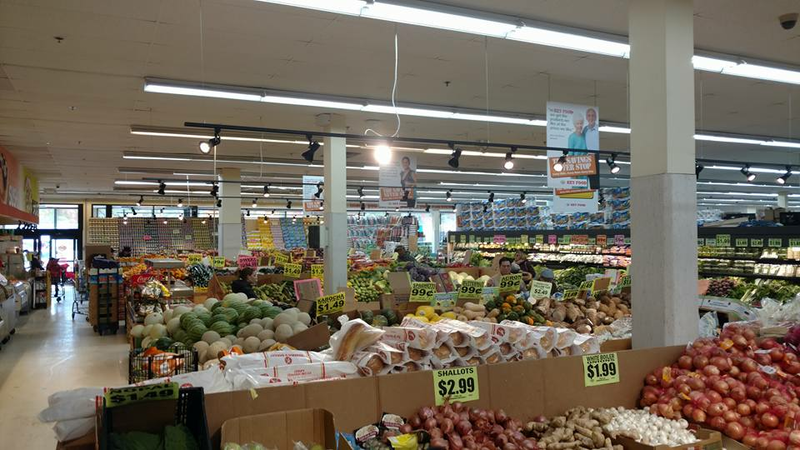 This store knows their market: Korean-style cuts, Kosher cuts, Halal cuts! It will be a while before they run out of styrofoam trays to put meat on! This dairy case still has its Food Basics logo! 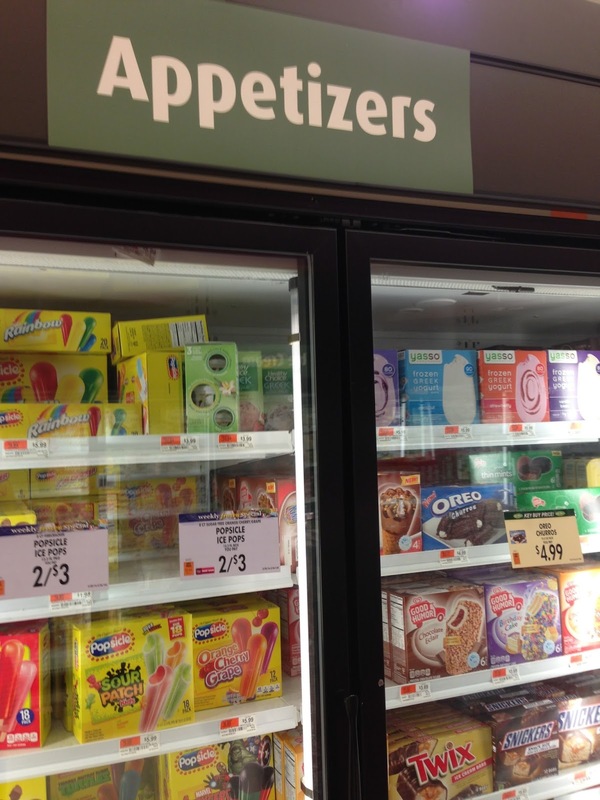 This aisle had some category labeling problems . . . In a kid's dream world, maybe! 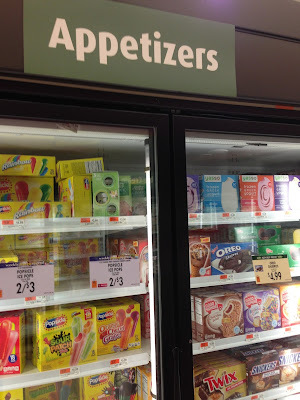 This one puzzles me - how could this case have previously held frozen vegetables when it's obviously a refrigerator case, not a freezer case?
. 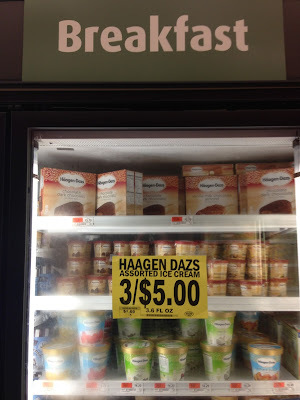 . . and some storebrand problems . . . 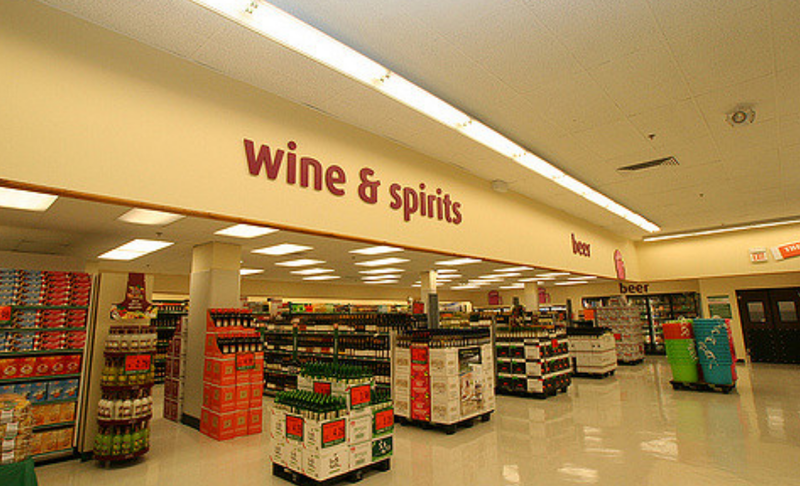 In the front of the last aisle is a large liquor department. 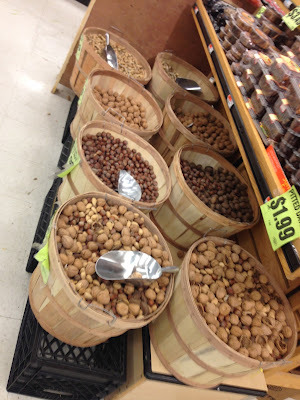 Key Food livened up this decor here. 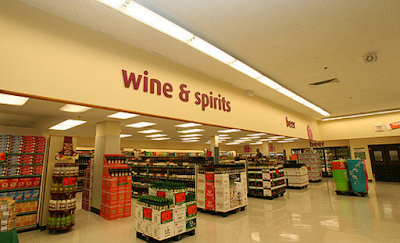 Below is what Food Basics' liquor department looked like back in 2009 . . . The customer service counter is actually located in the liquor department alcove, along with a small HABA section. This store has no pharmacy. The front-end seems reasonably unchanged since Food Basics left. 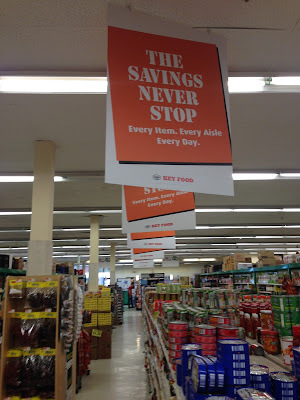 This is one of two, I think, stores operating today with substantially intact Food Basics decor. 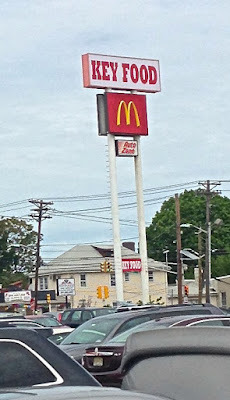 The other is Gala Fresh Farms in Paterson, NJ, which is supposedly going to be renovated some time soon. So you might want to come here and check it out if you're an A&P history fan!